Above: It’s difficult to imagine today, but this area was once a busy drift-mining colliery. Coal was unloaded from small canal boats at the head of a drift tunnel in the hillside, just a short distance from this bridge, and loaded onto railway wagons, as well as horse-drawn carts. I’ve always been curious about the tunnels, known as levels or adits, that extend from Burbage, on the outskirts of Buxton, to the two coal seams between here and Goyts Moss (see Coal mining in the Goyt). I’m not sure how far they extend towards the River Goyt, but there’s a sluice beside the road from Derbyshire Bridge to the reservoirs that drained water from the workings (marked on the illustration below). And that’s a distance of over a mile. I have spoken to a caving enthusiast who has entered the sluice and followed it for quite some distance (a braver man than me). It was quite some time ago, but he’s going to see if he can find some photos to post here. The mine sluice beside the road from Derbyshire Bridge to Errwood reservoir (click to enlarge). Alan thinks that railings have now been installed to prevent cavers entering the tunnel. Above: This illustration is based on a map in ‘A Walking Guide to Buxton’s Coal Mines’, published by Buxton Civic Association (click to enlarge). It shows the position of the two mine entrances (now both blocked), and the levels. As well as other features in the landscape, including coke ovens and railway sidings. Alan Roberts and John Leachs’ ‘The Coal Mines of Buxton’ is a rich source of information. The first miners dug vertical shafts to reach the two coal seams. The horizontal levels came later – a method known as drift mining. There were two main levels – marked on the illustration in yellow (Burbage Upper Level) and orange (Burbage Lower Level). The Upper Level was completed in 1754. The entrance to this tunnel has completely vanished from the landscape (as has the other one). But some features still remain on the ground today. 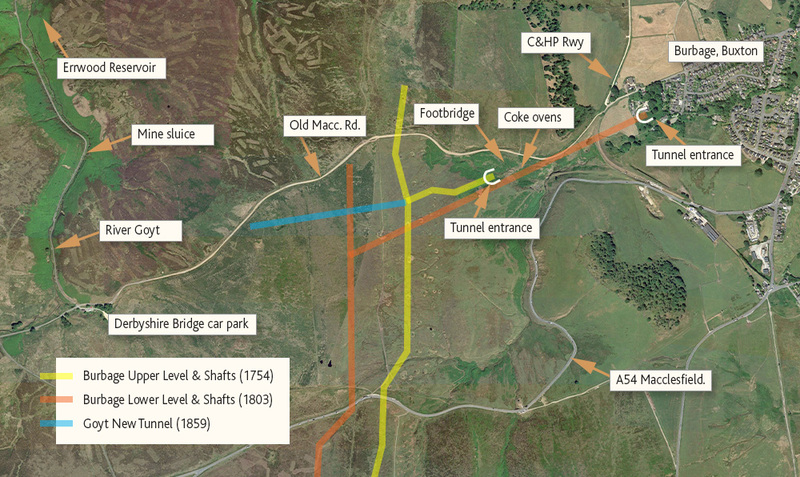 This higher-level tunnel extended to the ‘Ringinglow’ seam, and then branched north and south along the coal deposits. The image above shows a number of earlier surface-shafts which lay above the underground drift workings. 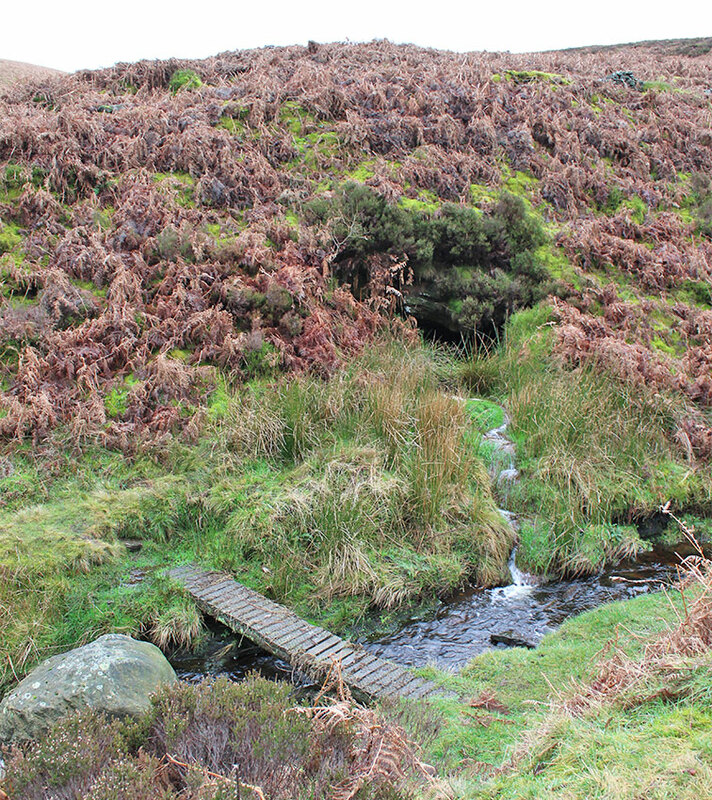 In 1859, this adit was extended towards to ‘Goyt’ seam centred at Goyt’s Moss (Derbyshire Bridge). At some point, small canal boats were introduced to transport coal back to Burbage along the partly-flooded tunnel. “Two lads were paid 8d or 1/- per day for boating the coals, which would have meant wading in the water and towing the boat a distance of 3,800 yards per journey.” They estimate that they’d have to do the two-way journey seven times a day. The entrance to this level now lies under a horse menage in private grounds. A narrow footpath from beside the house in Level Lane passes to the side of it. Rust-coloured water running under the path flows from these old workings*. This level was completed in 1803 and ran below the earlier one. But I’m not sure how close it came to the Goyt seam at Goyt’s Moss. I’ll update this page when I discover more. I’ll also take a closer look at the two coke ovens which lie just out of sight, close to the footbridge, as well as the railway sidings which connected to the Cromford & High Peak Railway. More than enough to keep me busy! Above: Oxide-tinted water from the old mine workings often colours the Wye all the way to Buxton’s Pavilion Gardens. 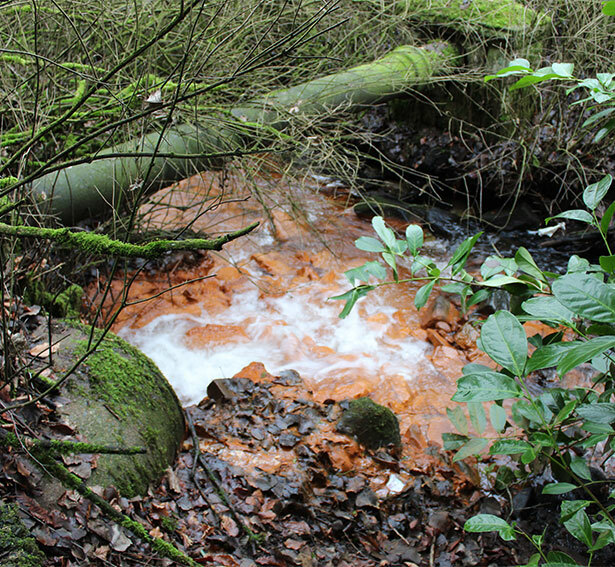 The rust colour in the water draining into the Wye is iron oxides, otherwise known as red ochre and used in paints. Before the dock area was covered over, it acted as a sump for solid materials flushed out of the mine, including the ochre. Early in the 20th century there was a trade in ochre, lifted from the dock, drained and taken away to local paint manufacturers. The local name was the “ocker brook” because of the coloration. It still spreads as far as the Pavilion Gardens once or twice a year and I have seen it spread as far down the Wye as Ashford in an exceptional year. Presumably there is a local build up within the old mine workings that gets displaced at times of heavy rain.